In the majority of instances, financial disclosure is an essential tool that your lawyer and the court will use to find the fair and just resolution to your case. Therefore, compliance on your part, even if your former partner is resistant, is key, as it is difficult for your attorney to argue to compel this information or ask that sanctions be levied on to your former spouse for non-compliance, if you are not already in compliance. The old adage “what’s good for the goose is good for the gander” and following the golden rule, is aptly applied in these situations, if you are not in compliance, you can’t really hold the other side accountable for something that you are not doing. In addition, some incomes are tricky to nail down, either due to self employment or cash income, but dealing with an attorney who has experience with complex financial matters will be helpful in proving what your spouse is actually earning and bringing home as income. 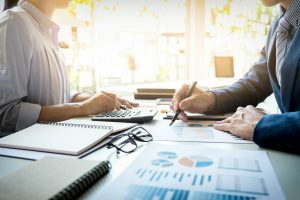 Financial disclosure between two people getting divorce in the State of Florida ultimately will lead to resolution in your case, and without it, both parties stand to remain in state of unknown, thus compliance and cooperation will benefit your case and ultimately, you moving forward with security. Wood, Atter & Wolf, P.A. is a law firm based in Jacksonville, Florida. The law firm has served the Jacksonville and North Florida community since 1957. Wood, Atter & Wolf, P.A. is a small law firm with the staff and attorneys in place to get the job done on Florida family law and other matters. Get a free family law book titled Florida Family Law – Enforcing Your Legal Rights and Rebuilding Your Life. This book has chapters on Divorce, Temporary Needs, Division of Marital Property, Division of Retirement, Alimony, Time Sharing (Custody and Visitation), Parenting Plans, Child Support and Enforcement. You can get this book for free at Florida Family Law Book.